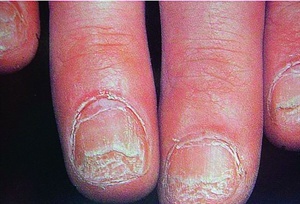 Because alopecia areata can appear on the nails, techs should be aware of this emotional, and often life-altering disease. The nail changes associated with alopecia usually accompany the hair loss, but may or follow the onset of alopecia by months or years. The cause of the disease is unknown, but the evidence is unmistakable. Entire patches of hair fall out as a result of the autoimmune system attacking the body’s hair follicles. Alopecia areata affects all ages and both enders. Though the disease is not hereditary, “one in five people with the disease has a family member who has it as well,” according to the National Institute of Health. Because it is an autoimmune condition, other autoimmune issues may be present in a person suffering from alopecia areata, such as asthma, allergies, rheumatoid arthritis, or lupus. Overall, however, alopecia areata often attacks an otherwise healthy child or adult. There are three types of alopecia areata. The common term “alopecia areata” is used when hair falls out of the scalp and leaves visible patches of baldness. “Alopecia areata totalis” is the term used for a total loss of hair on the scalp. “Alopecia areata universalis” refers to complete loss of hair on the scalp and body, ncluding lashes, brows, beards, and, in some cases, even the thin, protective coat of hair over the whole body. “In all forms of alopecia areata, the hair follicles remain alive and are ready to resume normal hair production whenever they receive the appropriate signal. In all cases, hair re-growth may occur even without treatment, and even after many years,” according to the National Alopecia Areata Foundation (NAAF).